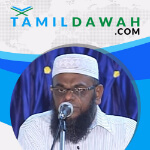 Abdul Majeed Mahlari is the Khateeb of Al – Jamiul Azhar Jummah Masjid, Kayal Patnam, Tamil Nadu. He is also the Principal of Ayisha Siddiqa Girls Islamic College, Kayal Patnam. He holds an Aalim degree from Mahlara Arabic College, Kayal Patnam, Tamil Nadu.